The location sharing feature allows a user to share location with other users and search for and view other users on the map, navigate to other users, and interact with viewable user icons on the venue map. SPREO’s location sharing component is available on any device, is usable on both location-aware devices as well as on location-unaware devices, and applicable to a variety of use cases. The directory of users who are given access to the location sharing feature is defined and populated through the integration with a third-party employee directory system or can be created in the SPREO database for client’s without such a system. SPREO’s platform could also allow users to create their own profiles for access to location sharing. SPREO’s location sharing has been built to offer a simple and intuitive user experience while keeping in mind privacy and security concerns. 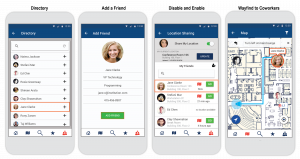 From the full list of users within your campus or facility, individual users create their own “friends” list of other users whom they are willing to share their location. Users are only able to share location with people who have mutually added them to their location sharing list. A user can turn location sharing on and off at any time. Once on, any user that has also added them and has location sharing turned on, can see the user’s location on the map and navigate to them, and vice versa. User’s have complete control over where they are displayed on the map. For users with location-aware devices, the user will ‘update my location’ – this triggers the app to calculate the user’s location then ‘pin’ them to the map. Their personal icon will appear on the venue map. To ensure discretion, a user’s location sharing icon will not move in real-time with the user as he/she moves around the campus or facility but will only be updated when the user chooses to update the location – others will only see the “pinned” location. For users handling location-unaware devices, the user will update their location by manually setting a pin on the map to where they are located. Turning off location sharing will completely remove the “pinned” location so that other users can no longer see the user on the map and will also remove the user’s ability to see others on the map. © 2019 SPREO LLC. All Rights Reserved.